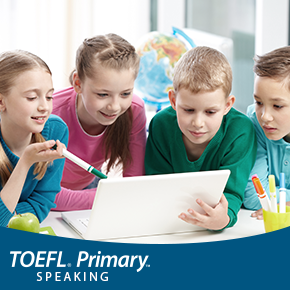 TOEFL Primary Speaking es un test creado específicamente para medir la capacidad en la comunicación verbal de todos los alumnos desde 8 años. Hacer peticiones y dar instrucciones sencillas. Describir personas, objetos, animales, lugares y acciones. Este test se puede hacer junto con TOEFL Primary Step 1 o TOEFL Primary Step 2, para completar el análisis de las habilidades del alumnos, o se puede utilizar por separado, como refuerzo para la habilidad Speaking. The student will see a picture and be asked to describe things that look strange in the picture. Response time: 20 seconds. A character will present some pictures and ask the test taker to choose one and express some thoughts or opinions about it. Response time: 15 seconds. A character will ask the test taker to make a request of another character in the story. Response time: 5–15 seconds. A character will present an object and invite the test taker to ask 3 questions about it. Response time: 30 seconds. Either a video or a sequence of pictures appearing one by one will show a character performing an activity. Afterwards, the test taker will be asked to explain how to do the activity that was shown. Response time: 30 seconds. The test taker will watch a video or view a sequence of pictures. After watching the animation or seeing the pictures, test takers will be asked to tell a story based on what they saw in the animation or pictures. Response time: 30 seconds. The Speaking test may also include some unscored questions used for warm-up or research purposes.